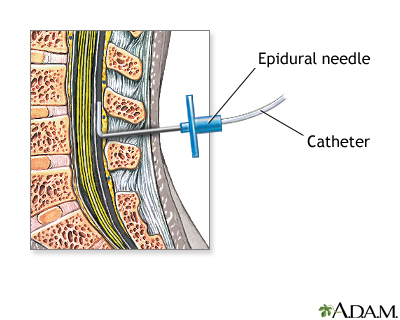 An epidural block is a numbing medicine given by injection (shot) in the back. It numbs or causes a loss of feeling in the lower half your body. This lessens the pain of contractions during childbirth. An epidural block may also be used to reduce pain during surgery on the lower extremities. This article focuses on epidural blocks during childbirth. How is the Epidural Given? The block or shot is given into an area over your lower back or spine. You may be asked to lie on your side, or you may sit up. Either way, you will be asked to pull your stomach inward and hunch your back outward. The provider inserts a needle into your lower back. The needle is placed into a small space outside your spinal cord. A small soft tube (catheter) is placed into your back, next to your spine. The numbing medicine is given through the tube for as long as it is needed. In most cases, you will receive a low dose because it is safer for you and baby. Once the medicine takes effect (10 to 20 minutes), you should feel better. 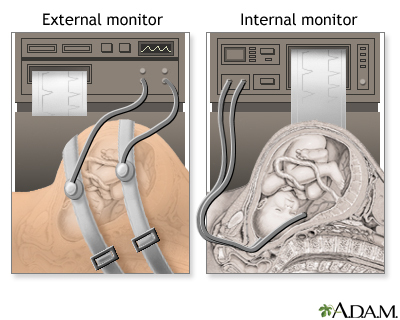 You may still feel some back or rectal pressure during contractions. You may shiver after an epidural, but this is common. Many women shiver during labor even without an epidural. Many studies have shown that an epidural is a safe way to manage pain during childbirth. While rare, there are some risks. Your blood pressure may drop for a short while. This might cause the baby's heart rate to slow down. To avoid this, you will receive fluids through an intravenous (IV) line to help keep your blood pressure stable. If your blood pressure shows a drop, you may need to lie on your side to keep the blood moving throughout your body. Your provider may also give you medicine to raise your blood pressure. An epidural block may change or alter labor and delivery. 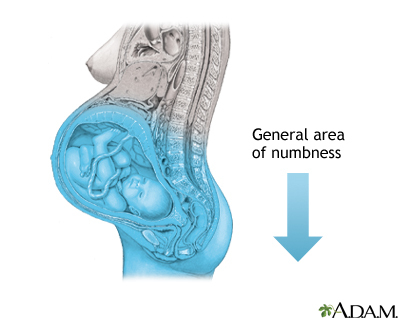 If you are very numb from the block, you may have a harder time bearing down to push your baby through the birth canal. Contractions may lessen or slow down for a little while, but labor will still move along as it should. In some cases, it may even go faster. If your labor slows down, your doctor can give you medicine to speed up your contractions. It is best to wait until you are in active labor to have the epidural placed. You may get a headache after your epidural but this is rare. Medicine could enter your spinal fluid. For a short while, it could make you feel dizzy, or you might have a hard time breathing. You could also have a seizure. This is also rare. 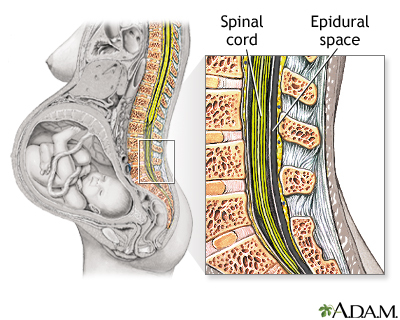 What Types of Epidurals are There? "Walking" epidural block. This type of epidural will lessen your pain, but you will still be able to move your legs. Most women are not really able to walk around, but they can move their legs. Combined spinal epidural block. This combines both a spinal and epidural block. It provides pain relief much faster. The combined block is used when women are in very active labor and want relief right away.